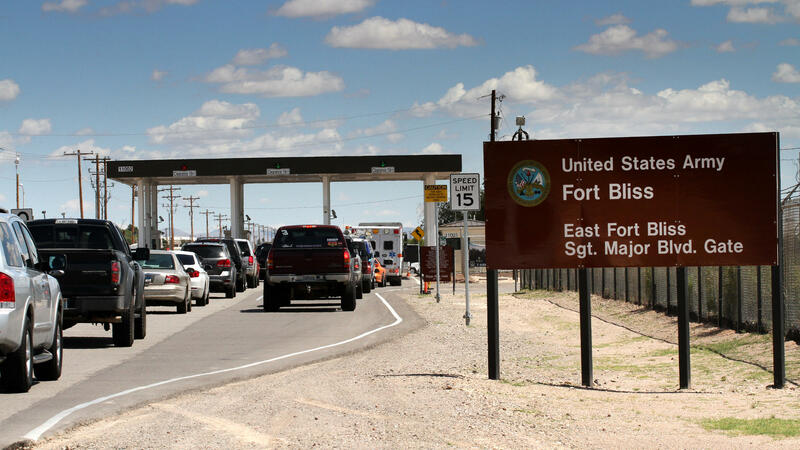 Cars wait to enter Fort Bliss in El Paso, Texas, in 2014. The U.S. Army Base is one of four that likely will be tasked with housing immigrant children following a request Thursday by the Department of Health and Human Services. It's unclear whether the space could be used for the family detention ordered this week by the Trump administration; the Department of Health and Human Services only handles detained children — separated from their parents or unaccompanied — while the adults are held by the Department of Homeland Security. Meanwhile, the Pentagon is being asked to provide 21 attorneys — most of them military officers — to help the Department of Justice to prosecute undocumented immigrant cases in California, Texas, Arizona and New Mexico. All right, now where families may be housed will depend a lot on what the Pentagon can do. The U.S. military has been asked to provide facilities for migrants. NPR's Pentagon correspondent Tom Bowman has been trying to get some details on how this might work. He's here with me now. Hey, Tom. TOM BOWMAN, BYLINE: Hello there. KELLY: How many beds are we talking? KELLY: Coming up in a few weeks, yeah. KELLY: Do we know which military bases we're talking? This would be on existing military bases near the border. BOWMAN: ...Finding space for them. KELLY: Right, and in flux. And we're talking families, just children - do we know? BOWMAN: This would be - HHS is asking for up to 20,000 beds for unaccompanied children. BOWMAN: But you're right. As far as where the families would go, would that be part of this as well? Would Department of, you know, Homeland Security be asking for additional bed space for families? At this point we don't know. It's only HHS at this point. KELLY: So are we talking barracks? I mean, we're talking 20,000 additional beds on these bases. BOWMAN: ...At Fort Bliss to put all these folks in? And he said probably not. So you'd have to likely create some sort of a tent city at some point. And - but we don't have an answer to that yet. KELLY: Another question is - we're talking unaccompanied children, thousands of unaccompanied children. What kind of facilities might be there in terms of playgrounds, facilities catering specifically to kids? BOWMAN: Yeah. We don't have an answer to that either. During the Obama administration, they did house thousands of children for a short time at some of these very military bases, so I'm not sure exactly the facilities they created. Did the Army have a playground there or stuffed animals for these kids? We really don't have any detail right yet about what these facilities would look like. KELLY: Has anything ever been done like this before? KELLY: And I guess in terms of this scale, the numbers. BOWMAN: Right. The numbers are very, very large of course. KELLY: So does the military say it's ready to do this? Are they on board? BOWMAN: Defense Secretary Jim Mattis said, we will see what we can do here. And again, it's - they're asking - HHS is asking the Pentagon, you know, can you fulfill this? I mean, how many beds can you provide? So we don't have an answer yet from the Pentagon - oh, we can provide 20,000. They may say we can provide half of that or three-quarters of that. At this point we really don't know. But what we do know is these two bases, Fort Bliss and Goodfellow Air Force Base, are some of the ones we expect to have these temporary beds for undocumented children. KELLY: ...Is happening at the border. NPR's Tom Bowman, thank you. BOWMAN: You're welcome. Transcript provided by NPR, Copyright NPR.